Coming in January is EE’s exclusive Diamond Select produced Gold Handle Type 2 Star Trek phaser. 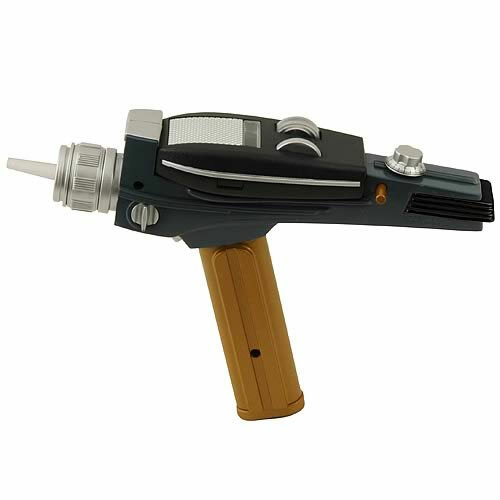 Just like the original phaser, this replica includes a Type-1 detachable mini hand-phaser that separates from the original Type-2 pistol. This prop includes realistic beam lights, sound effects, and adjustable power settings. To activate the sound, you must remove the plastic display tab and turn on the hand phaser. This is done by clicking the far right dial forward toward the front of the pistol. To trigger the lights, rotate the front dial forward. Measures 9 1/2-inches long x 9 1/2-inches tall x 3-inches wide. The exclusive aspect of this phaser replica is that you can only get it from Entertainment Earth and nowhere else. Yes, it’s identical to the White Handle Type-2 Phaser, except of course for the color of the handle.